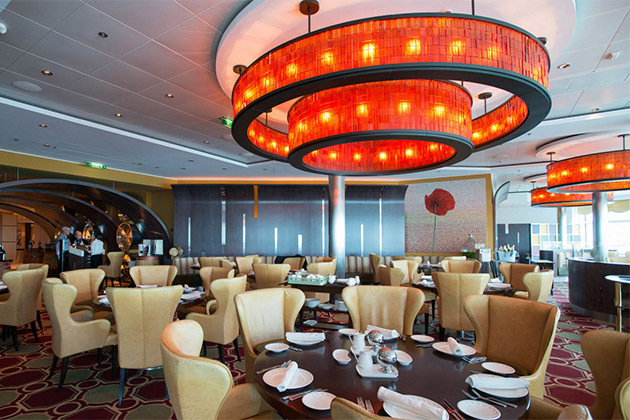 Italian and contemporary, Tuscan Grille is Celebrity Cruises' interpretation of Tuscan cuisine in a steakhouse restaurant setting. It's perfect for all occasions, from a romantic night out or a celebration with the family. 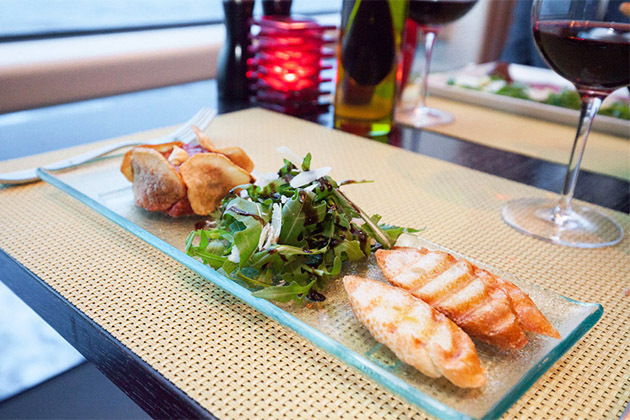 Diners will enjoy fresh antipasto, a marbled steak and a glass of Italian wine, recommended to you by the ship's onsite sommeliers. Special touches include rosemary-infused olive oil, displayed in giant decorative bottles as you enter, and pasta made in house, which you can watch through a window to the back kitchen. The restaurant is popular for its ocean views, but windows only line one wall so book a reservation in advance and dine early to watch the sunset. The Italian eatery replaced the S.S. United States restaurant on Celebrity Infinity and The Normandie on Celebrity Summit in 2016, during refurbishment. Walking into Tuscan Grille you must pass under wooden arches that encircle the entrance, reminiscent of aged casks you would find in a wine cellar. The venue does have a significant wine collection, displayed in glass-doored cabinets also flanking the walls of the entryway. The restaurant is spacious, with a variety of booths and tables, but some are offset to provide couples a quiet space for sharing candlelit intimacy. The color scheme incorporates golden-dandelion yellows with dusty reds; dark wood finishes modernize the "rustic" elements of the space -- lantern-style lighting fixtures and a carpet depicting a pattern of vines and wine grapes. Tables are set to match: glasses are red, olive oil shines yellow and salt and pepper shakers pull in the dark wood finish; placemats are beige and napkins are brown. Tuscan Grille stays continuously busy during dinner -- early birds come for the views of port and ocean (from the floor-to-ceiling glass windows that line the back of the restaurant), while night owls chat over limoncello and a cheese plate late into the night. The dress code is "smart casual," meaning you don't have to get dressed up, but no one will stop you from getting spiffed up. 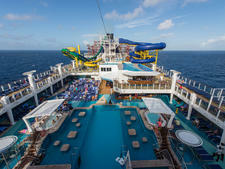 Dinner is served nightly, while lunch is served once per cruise (same menu). "Wine Connoisseur" dinners are also held throughout your cruise for an additional fee; wine is not included in your meal unless you book a wine-pairing dinner. More of a negroni person? A special Italian cocktail menu is also offered to match your meal. Starters might include ahi tuna, filet mignon carpaccio or calamari; soups and salads encompass Italian favorites like minestrone or buffalo mozzarella with tomato, along with nuanced dishes like a Tuscan onion soup; a full menu of homemade pasta such as lobster pappardelle Alfredo or golden saffron risotto, accompany a full list of steak and seafood -- choose from seafood stew, grilled red snapper, a grilled strip steak or a bone-in veal chop. Sides reflect comfort food like truffle steak fries, baked pecorino mac and cheese, garlic mashed potatoes and sauteed spinach. For something sweet, splurge on chocolate fondue or a dessert sampler. For an additional fee beyond the cover charge, diners can enjoy premium cuts of meat including an 18-oz. dry-aged NY strip for $15 or a 22-oz. dry-aged portherhouse for $18. Tuscan Grille costs $45 per person for dinner, and $35 for lunch. 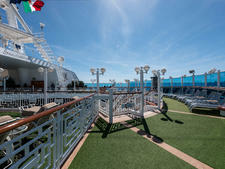 Which ships have Tuscan Grille? View pictures of Tuscan Grille.